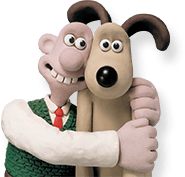 Aardman has teamed up with leading software publisher Kudlian Software to create this fantastic stop-frame animation software. Animate It! allows you to create your own stop-frame animated movies easily and quickly. All you need to do is download the software, plug in a webcam, grab a character and get animating! Got a technical query about using the Animate It! software? Or perhaps you need a bit of help to use some cool effects and tricks in your animations; hopefully the video below will answer your questions and get you animating in no time! You can also take a look at the other ‘how to’ videos in the Get Animating section. If your query is more about technical set up or you’ve encountered a problem with, say, adding sound or saving your animations, software developer Kudlian can help. You’ll find PC and Mac user guides, offering very thorough guidance on all aspects of using Animate It! Find out how to add audio, import and export files, add titles, backgrounds and much more. You can also contact Kudlian direct with your query at support@kudlian.net. "For kids who are interested in making movies but don't know how or where to begin, Animate It! is perfect. It's detailed without being overwhelming, and kids will love the tutorial videos and finding their own inspiration."